Artisan Bakery Comes To The Eastern Shore! MUSQUODOBOIT HARBOUR - Freshly baked bread and scrumptious cookies! That’s what Paul Nicholl has brought to the Eastern Shore with his business, the Dobbit Bakehouse. A graduate of the Nova Scotia Community College’s Boulanger and Baking Arts program, this gay entrepreneur has opened his bakery in a former pizzeria on Highway 7 across from the old Musquodoboit Harbour train station. Dobbit Bakehouse carries bread, rolls, muffins, cookies and pies: all of it handmade, all of it fresh. “I want everything we make to be wholesome in that it won't have added preservatives, stabilizers, or other common additives found in packaged foods these days,” says Mr. Nicholl. He plans to make all his products using natural, local and, when possible, certified organic ingredients because it’s better tasting and more nutritious to do so. He even has plans to eventually develop a line of products that are diabetic-friendly. Making his business kind to the environment is also a priority for Paul. He’s been using recycled equipment, paint and materials in much of the renovations, and he will use recyclable packaging (no plastic shopping bags will be available) and environmentally friendly cleaning products once he’s open for business. Generally he’s doing his best to be respectful of the earth, air, and water as that’s an approach to life that he says matters a great deal to him. Paul is also making it a priority to keep a local focus to his business. “I want to contribute to the local economy by using local suppliers, hiring local people, and making products for local customers,” says Mr. Nicholl. Initially Dobbit Bakehouse will just have counter service offering Paul’s freshly baked goods. However, plans are to eventually have coffee, tea, and hot chocolate available and the bakery will have a small seating area for customers who can’t wait to get home to dig in. Mr. Nicholl says he’ll be happy to reserve items for pick up later the same day (call 889-2919). Special orders will be welcome too; though he’ll need a couple days notice for that. He’s hoping to have everything in place to be open for business for the beginning of September so keep an eye out for Dobbit Bakehouse at 7896 Highway #7. Planned hours of operation are: weekdays from 10:00 a.m. to 7:00 p.m., except closed on Wednesdays; Saturdays open from 9:00 a.m. to 6:00 p.m.; and from 8:00 a.m. to 6:00 p.m. on Sundays. 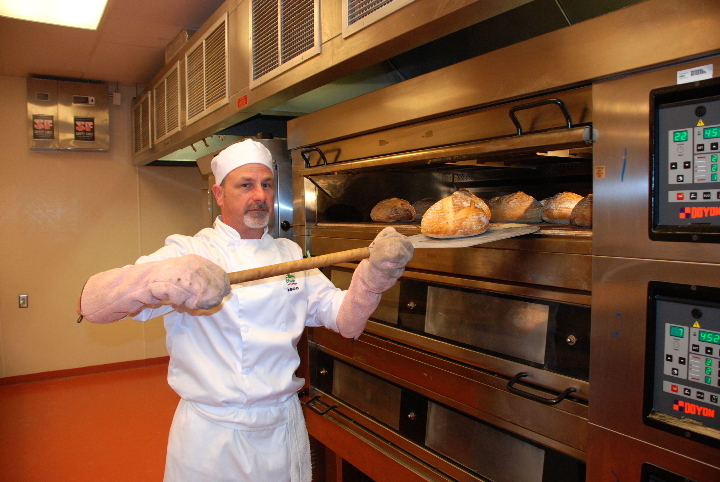 Paul's bakery was featured in the Chronicle Herald JoelJacobson? story on October 1, 2008, page B3, From job in IT to opening a bakery.